medentex from Bielefeld (Germany) is a full service provider in the area of dental waste collection. They use CurTec screw top drums and jars as collection containers for waste containing mercury, because they are UN certified, easy to handle and sustainable. Mercury has a toxic effect on humans and animals. With oral ingestion and absorption through the skin, the absorption rate is only 1%. However, when inhaled around 80% of mercury vapor is absorbed by the lungs and leads directly into the bloodstream. This can damage the central nervous system. The World Health Organization (WHO) therefore recommends an exposure limit for mercury vapor of 50 μg/m3. According to a study of various collection systems, there is a clear health risk when waste containing mercury is stored in containers without mercury vapor absorbents at for instance dental practices. The measured values exceed the MAC value by as much as 68 times. For systems with an absorbent, the average values are 95-99% below the MAC values. medentex has carried out an extensive investigation into the determination of mercury vapor concentration in collection containers for waste amalgam in dentistry. Based on the research results, they have modified their collection containers for waste that contains mercury. medentex offers a comprehensive range of waste collection systems for dental waste equipped with Medentovap®. Medentovap® is a special system with a substance that absorbs mercury vapor. In future, dental practices will continue to produce mercury-containing waste such as amalgam residues, spent filters, empty amalgam capsules and sludge, which is why medentex will always have to offer state-of-the-art products. As a result, it is not surprising that medentex chose high quality packaging. Various criteria have influenced this choice. They offer their services not only in Germany but, through their parent company Rentokil, also in many other European countries and the United States. medentex maintains high quality standards which is why, although it is not required in all countries, they use UN certified packaging. Another important point is handling and user friendliness. Dental practices often have little space and cannot store large collection containers. Moreover, a container needs to be opened and closed several times a day and this should require minimum effort. The 6 liter Wide neck drum offered the perfect solution: it is small in volume and the screw lid makes it user-friendly. medentex offers several different collection containers for dental waste products, each with their own label: Packo screw top jars for the collection of amalgam capsules and residues, Wide neck drums for amalgam sludge and filter sieves and Click Pack screw lid pails for amalgam separators. Sorting is costly but correctly labelled collection containers help simplifying the task. Quality is a strategic tool for strengthening image and market position. medentex positions itself as a high level service provider. They chose the 6 liter Wide Neck Drum because a customers’ perception of quality also has a positive effect – a decision that did not escape the competition who followed the market leader’s packaging choice. 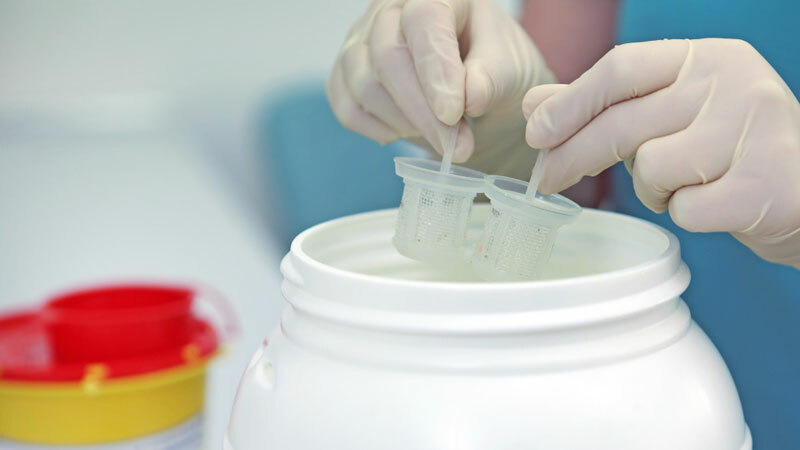 The materials and construction of plastic CurTec containers make them suitable for reuse – which takes place at the collection system in Germany: the drums are cleaned after emptying, equipped with a correct inscription and functional lid and used again. Only when the plastic discolors or starts to smell, the containers are destroyed and replaced by new ones. That way, the average lifespan of a container is about two years. medentex wishes to recycle more containers in future which will positively affect the durability and total cost of its supply chain. At the same time they want to copy the German collection system to other countries in order to further recycling and reuse. By investing in high quality packaging, medentex has ensured the safety, reliability and durability of their operations and at the same time lowered their supply chain cost and raised their customers’ satisfaction. Formulating packaging requirements is not an easy task. CurTec can help you by reviewing your supply chain. Performing a Packaging Scan results in a free report which makes choosing the most optimal packaging solution much easier.